Barbecue is my passion! It always has been my favorite food. I have traveled to almost every part of this country searching for great BBQ and have certainly found it! From the Carolinas to Georgia. Tennessee. Kansas City, Florida, California, and Texas, I have come to understand what real barbecue is all about. The perfection of the cooking method, spices and sauces are important, but even more crucial is patience, dedication and care to smoke great "Que"! The Northeast is first learning what real barbecue is all about. What we call BBQ is not barbecue at all. Cooking food on a grill over charcoal or a gas fire is called "Grilling". This is not BBQ. Barbecue is cooking foods at low temperatures for long periods of time with indirect heat (SMOKE) coming from the burning of various blends of wood and the regulation of moisture. For example. to make truly great BBQ ribs, it takes up to six hours of cooking time. Our brisket and pork take 12 to 13 hours to slowly cook. This is true smoking! This is true BBQ ! This loving care to satisfy the customer with great BBQ is what makes a BBQ joint successful. Our goal at Smokin' Al's is just that. We want you to have a satisfying meal and a wonderful, satisfying experience. For years I had been smoking meats and developing my sauces, spices, and side dishes for close friends and family. I loved the look of satisfaction on their faces as they dug into my barbecue. My dream had always been to bring this joy to others. 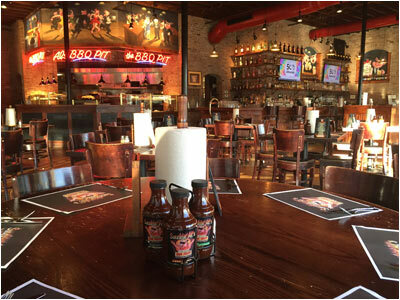 Smokin' Al's has made this dream into a reality. Since our 2003 opening in Bay Shore I have seen over 2 MILLION people dig into my barbecue. I never get tired of seeing people enjoy! If I make you happy, my dream has come true! You may notice a pinkish color in our BBQ meats. This is the natural result of the authentic smoking process we use. By no means does the pink color mean the meats are undercooked. Rest assured, all our slowly smoked meats have been thoroughly cooked. The "Pink Smoke Ring" is the pit master's sign of excellence! © 2015 Smokin Als Famous BBQ Joint. All rights reserved.